Back in 1999, while shooting video of a tornado for The Weather Channel in northern Kansas, I used an old Pentax K1000 camera to capture the scene on film as well. After seeing the results on print, I was determined to learn more about photography. It offers much more on the artistic side than video does. I wanted to learn how to make images come alive and show the beauty and power of a storm. Well, I never really KNEW, it just happened. While operating my storm chasing tours, I was always a videographer first, photographer second. The video market was my bread and butter, while photography was actually more of a hobby. I always took pride in my videography, pushing the limits to get that close-up and intense tornado shot where most others wouldn’t go. After this past decade of learning how to photograph severe weather, I now find myself grabbing my camera first, and shooting video second, if at all! The most important thing to me after taking care of my clients on tour is capturing that intense, jaw-dropping storm image. None received. I am nearly self-taught. A few books and friends helped along the way, but the school of hard knocks, trial-and-error is the path I took. Were you influenced by a famous photographer’s style? No. For me, it was trying to create my own thing, my style. How to capture a storm in a way that makes it come alive, even fearful at times. I have always been a freelance videographer/photographer, thus no real assignments, per se. My storm-chasing tour operations are first and foremost for me, so a true “storm” photography assignment would be hard to accept. Do you specialize in a specific type of photography? Severe and unusual weather. I have been interested in severe storms since I was a child in eastern Kansas. That fascination has led me to the career path I now follow, which is life on the road all spring and summer in pursuit of severe weather. I could never see myself going back to an 8–5 desk job ever again (I was a contract administrator by trade). People who know me know how much time and effort I devote to severe storms. I have witnessed more than 600 tornadoes and never tire of seeing another one. They are the most powerful force of weather on earth. Whether it is tornadoes across the plains, super-cell thunderstorm structure images, lightning of the desert southwest, or rolling prairie grasslands interacting with a storm, I will be there to photograph it! I have been working in the photography field since 2006. Since all of my work is related to the storm chasing tours, we operate (www.silverliningtours.com), I would have to say a day we were in southeast Colorado and intercepted on tornadic super-cell storm near Campo. There was no one on this storm for a long time and thus we could take our time and photograph it continuously. It produced 4 tornadoes and the final one was this amazing backlit (tough to photograph!) tapered cone that was on the ground for 30 minutes. It is the tornado photo featured in this interview. Wide open prairies, didn’t destroy anything, and remained extremely photogenic its entire life cycle. I would have to say a combination of landscape and the elements. A storm is a beautiful and powerful thing. I feel they are living and breathing creatures of nature. I try to capture the storm in its majesty and beauty, as well as showing the danger and awe that a tornado portrays, knowing that you can be close, but being too close is like approaching a grizzly bear, give it respect, but know if you push it too far, it can hurt you. I try to be close for those intense tornado photos, but stay back to photograph a storm as it interacts with the landscape and produces a beautiful sight. Outdoor Photographer, Weatherguide Calendars, and various magazines and college text books through my stock agency. We have been featured on The Weather Channel, National Geographic, the Discovery Channel, the Travel Channel, NOVA, the History Channel and every major American TV network. We have also been featured in documentaries around the world. During 2010, Hunting Nature’s Fury. More of an autobiography/storm-chasing accounts and techniques. Unfortunately, I am on the road so much and devote an incredible amount of time to our storm-chasing tours that I haven’t submitted anything. Hopefully that will change with time. Wow, that is a tough one. There are many, for different reasons. For intensity, I would likely say a photograph of a violent EF4 tornado near Bowdle, South Dakota on May 22, 2010. We approached this tornado from the southeast and it passed within a quarter mile of us, producing 200 mph winds. The photograph shows the violent category tornado with stark contrast looking like it was coming straight at me. For beauty, I would have to say a photograph in the old “film” era from May 31, 2001, of a super-cell with the appearance of a spaceship in northwest Texas. This storm survived for nearly 12 hours and produced hail grapefruit-size and 3 tornadoes. The photograph shows the storm’s structure as well as a bolt of lightning and my tour guests in the foreground. Very intense and powerful. Again, with my being on the road constantly I have not submitted my photographs to galleries and established any exhibits. Hopefully, during 2012, that will change. My wife Caryn Hill (www.carynhillphotography.com) conducts storm-chasing photography tours during June each year. These are quite unique and not offered by any other company. These tours combine the power of severe storms and landscape photography into one adventure. We also offer monsoon storm photography tours in Arizona and Utah during August through our www.southwestphotographytours.com Web site. These tours combine the beauty of the desert southwest with the annual monsoon storm season, and produce amazing results. Lightning over the magnificent red rock of Arizona and Utah is quite spectacular. Both sets of tours are designed for the amateur and experienced photographer alike. Honestly, I think composition. Sometimes, trying to put too much into one photo or not properly metering light. In storm photography, you throw many of the basic rules out the window. Breaking down your shot or positioning with a storm or tornado creates dramatically different results. Positioning and composition is everything. With what brand name equipment do you shoot? I use a Canon 5D Mark II, as well as a Canon T2i as my backup. I have 17–40mm, 24–105mm and 70–200mm lenses and a Lightning Trigger (www.lightningtrigger.com). I use various tripods and weights due to strong winds. I also maintain a wide variety of filters. I do. I give talks at various groups and organizations throughout the year, so developing multimedia presentations is critical. I use a Canon XF100 and a Sony Z7U as my primary video cameras. I also produce an annual storm-chasing highlights DVD set that features all of the fun storm-chasing intercepts with video and photography embedded. You can see these at my Web site www.stormchase.net. Never take anything for granted. Always work hard to obtain the shot you want, not settling for second best. Spread the word. Let as many people know about your work as you can. Marketing yourself is hard and much work, but it’s how you achieve success. Find something different and unique and capitalize on it. It can be a challenge, but that’s what makes us unusual and unique. Roger Hill lives just east of Denver, Colorado in the heart of the high plains where tornadoes and super-cells rule. He has been chasing for nearly 25 years. He has seen and videotaped more than 600 tornadoes in his chasing career, as of this writing. He spends an average of 120 days between March and October chasing, operating tours and shooting video for various media outlets. He also chases tropical cyclones and has documented many hurricanes, including Charley, Jeanne, Katrina, Rita, Ike, Gustav and even Super Typhoon Krosa in Taiwan. He has also been a probe driver for various National Severe Storms Laboratory projects and teaches severe weather classes. Roger owns a variety of equipment for still photography, including the Canon 5D Mark II and T2i, as well as several lenses. Roger is also proud to have Sony as his sponsor and has several professional camcorders, including the amazing Z7U, Z1U and the A1U, as well as the Canon XF100. He has been contracted by The Weather Channel during the past 15 years to shoot and edit video natural events, from tornadoes to floods to blizzards and hailstorms. He has also done much work for The Discovery Channel, The Learning Channel, National Geographic, The Travel Channel, NOVA, the History Channel, BBC and many more. He is also coauthor of the book, Hunting Nature's Fury. 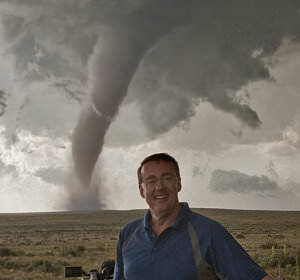 Roger is co-owner of Silver Lining Storm Chase Tours, the nations' largest storm-chasing tour company. Roger loves the outdoors and is also an avid bowler where he holds a 230 average with countless 300 games and 800 series under his belt. Roger’s wife Caryn is also an acclaimed storm chaser. She drives Van 1 during tours and runs the on-call and local tours during the spring and summer months. She also run the SLT Photography Tours and is an excellent photographer (www.carynhillphotography.com). She has more than 150 tornadoes under her belt and countless hours on the road driving in adverse weather conditions. Caryn raises and shows quarter horses during her spare time and was a finalist at the largest quarter horse show in the world, the 2009 American Quarter Horse Congress. Roger and Caryn have been married more than 8 years and enjoy spending time with each other chasing, showing horses, on the bowling lanes or just enjoying the outdoors. During recent years, Roger and Caryn have been hiking and canyoneering the southwestern U.S. and have photographed many slot canyons, landscapes and mountain’s natural ice sculptures.